because he was a great saint. He lived the life of a saint. What he did during his life touches all nations. During World War II, I was a member of the American 15th Air Force stationed in Foggia. While in Italy, I visited Padre Pio and Mary Pyle in San Giovanni Rotondo. I had the honor of serving Mass for Padre Pio and being in the vestry when he put on his vestments for Mass. While there, I asked to be kept safe through the war if it was God’s will. The next day I was to fly on a very dangerous mission. That night, I developed a severe ear infection. The air force doctor refused to let me fly the next day. I pleaded with him to let me fly with my friends but he said absolutely not. I tried in every way to fly but was stopped. How sad to say that the flyer that took my place on this mission was killed by a direct hit by an anti-aircraft shell. If I had been permitted to fly that day, I would have died. 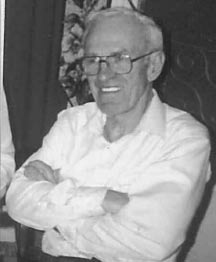 Joe Revelas who currently lives in Clarksboro, New Jersey, met Padre Pio in 1944 when Joe was in the U.S. 15th Air Force division, stationed near Cerignola, Italy during World War II. One day Joe’s chaplain told him that there was a priest named Padre Pio living in a monastery in San Giovanni Rotondo, who had the wounds of Christ. Joe decided that he had to visit him. Public transportation was not readily available during war times so Joe hitchhiked to the monastery. When he arrived, the first person he met was Mary Pyle. Joe told Mary that he intended to go to Padre Pio’s Mass the following day, Sunday, but she insisted that he go at once to the monastery to meet Padre Pio. Joe did not feel prepared and the idea intimidated him. “I am sure Padre Pio has more important things to do than to meet me,” Joe said to himself. Nevertheless, he did what Mary suggested. In the monastery, a priest greeted Joe and asked him the reason for his visit. Joe said he was planning on attending Padre Pio’s Mass the following day. The priest left for a moment and returned with Padre Pio. Joe was feeling very nervous by now but Padre Pio smiled at him and put him at ease. He was friendly and asked Joe about his life and his work in the military. When they said good bye to each other and as Joe was leaving, he looked back and saw that Padre Pio had knelt down to pray, facing the altar of the church. At the Mass the next day, Joe and the other soldiers who were present were allowed to be in the sanctuary of the church, very close to Padre Pio. Joe noticed his deep recollection during the Mass. At the consecration, Padre Pio stared intently at the host and tears fell from his eyes. There was complete silence in the little 16th century church of Our Lady of Grace. Joe saw clearly the wounds in his hands. “I could feel the presence of Jesus on the altar,” Joe said. “It was awesome. It was like being present at Calvary at the crucifixion. It was the most beautiful Mass I ever attended in my life. I will never forget it.” Although the Mass lasted for two hours, it did not seem long. Afterward, Padre Pio blessed Joe’s crucifix, kissing it reverently before giving it back to him. Joe, who is now 84 years old, sleeps with the crucifix that Padre Pio blessed, under his pillow every night. Although it was more than 60 years ago when he met Padre Pio, the experience remains very vivid in his memory. “Padre Pio has helped me all these years to stay close to God. I thank God for allowing me to encounter Padre Pio,” Joe said. This is just a short little note to tell you that I have sent you 100 little Sacred Heart cards with a novena which Padre Pio says every day with the whole community for all of those who ask for his prayers. I thought that it would be nice for all of his far away spiritual children to join their prayers to his. Let us pray with him and according to his intentions. Padre Pio is becoming more wonderful every day. Consequently the crowds who come to him for help increase and it is a real problem to be able to approach him. Two weeks ago, he healed a paralyzed woman, who had been carried into the church and went away walking without help. You can imagine the excitement, but still more wonderful are the conversions and there are many of them. Do let us try to do our little bit in helping him with our poor little prayers. 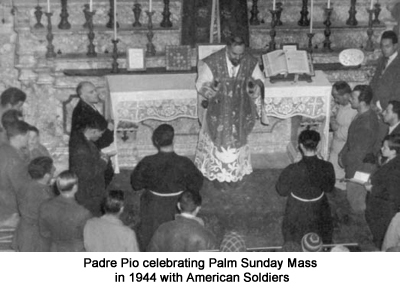 :During the war the woman went to confession several times to Padre Pio. When her brother came back from the war he could not decide whether to continue on in the military or to go into business. She wrote a letter to Padre Pio asking for advice for her brother but gave no information regarding his name, address, or military rank. Almost immediately, her brother got a response back from Padre Pio which included his name, address, officer’s rank, and regiment. Padre Pio told him that it didn’t matter what work he chose to do because our Lord would treat him in the very same way he had treated his soldiers during the war. The woman was amazed at the words of Padre Pio. She made enquiries and learned that her brother had been more of a father than a superior to the men he was in charge of. He personally looked after his soldiers with paternal affection when they were sick. All of the soldiers adored him. The woman added that after the war, her brother met with success in all of his undertakings, just as Padre Pio had predicted. In 1916, while in Foggia, Padre Pio and his little nephew one day visited the home of Serafina Pipoli. He asked Serafina to call her nephew and allow the two boys to play together. She has a great veneration for Padre Pio and immediately agreed and so Michelino came to play with Padre Pio’s nephew. When Padre Pio came back to collect his nephew, Michelino’s mother, Rosa, was there also. She asked Padre Pio to pray for her husband as he has been called up to military service once again and was a soldier in the war. Padre Pio said, “I will pray a great deal. But let us all pray to Our Lady because when Michelino grows up there will be another war, and he, too, will go.” Padre Pio’s prophecy came true for in 1940 Italy went to war and Michelino was called up and took part in it. I was honored to meet Padre Pio when I was in the military as a pilot stationed in Foggia, Italy. I had one engine blow up as I was flying a twin engine fighter known as a P38. The black smoke was pouring out but after a time the smoke died down and I returned to the base on one engine. The next day I was checking with the head mechanic and he said, “I have been here a long time and I have seen many things, but that was an act of God if ever I saw one.” When I met Padre Pio he had put his hand on my head and he did the same to the others who were with me. He gave us his blessing that we would all return home safe. From the homily of Archbishop Domenico D’Ambrosio given at the Immaculata in San Diego, CA on October 5, 2004. Archbishop D’Ambrosio is the delegate to the Holy See for the shrine and works of Padre Pio, the director general of the Padre Pio Prayer Groups throughout the world, and the president of Padre Pio’s hospital, the “Home for the Relief of Suffering” in San Giovanni Rotondo, Italy. “I bring you all the blessing of Pope John Paul II. The Pope told me that it is a great joy for him to know that the Catholic churches in the United States are making an effort through their service, to imitate and to follow the teachings of St. Pio of Pietrelcina. Padre Pio’s life was made up of two important parts – God, and his brothers and sisters. His ministry has been an epiphany of the merciful face of the Father; and before the Father, Padre Pio’s prayers were a constant intercession on behalf of all. His holiness, Pope Paul VI, said that Padre Pio was like an imprint of the Crucified Christ. Padre Pio reminds the world of the strength of the Cross. He participated in the sufferings of Christ for the world’s salvation. In Padre Pio’s heart, there was a place for everyone. For all he prayed for deeper conversion, new life, fidelity and witness. Today we are invited, according to the words of Pope John Paul II, to pray for peace in the world, in Iraq, in Israel, in Sudan, and everywhere that war brings violence, hatred, and death. In our Eucharistic celebration today let us ask for peace, love, and unity, and we offer our prayers for all of the American soldiers who have died in Iraq. Please do not forget Padre Pio’s hospital, the “Home for the Relief of Suffering,” a “temple of faith and science where the human race finds itself in Christ Crucified as a single flock under one shepherd,” as Padre Pio said. He also said, “May God bless those who have worked for this hospital and those who will work for it. May the Lord reward them a thousand times in their life and with eternal joy in the life beyond.” The Home for the Relief of Suffering needs your help and your prayers very badly in order to continue the work and the mission of its holy founder.